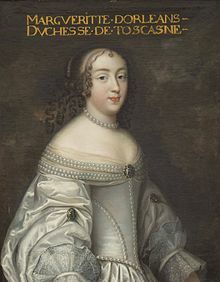 Marguerite Louise d'Orléans (28 Julie 1645 – 17 September 1721), a Granddaughter o Fraunce an later became Grand Duchess o Tuscany, as the wife o Grand Duke Cosimo III de' Medici with whom she haed three childer including the last Medici Grand Duke o Tuscany. In later life, she eventually adopted more conventional behaviour, took up pious works an even reformed the convent that became her second residence in the Paris suburbs. As the years went by she suffered serious setbacks to her health an the sadness o mourning her eldest son, Grand Prince Ferdinando, for whom she haed haed a genuine affection. Rendered financially independent by a legacy, she purchased a house in Paris, from which she spent the end o her life dispensing charity an keeping up dignified correspondence. Ferdinando de' Medici, Grand Prince o Tuscany (1663 - 1713) mairit Violante Beatrice o Bavarie, nae childer. Gian Gastone de' Medici, Grand Duke o Tuscany (1671 - 1737) mairit Anna Maria Franziska o Saxe-Lauenburg, nae childer. 12 Juin 1661 – 23 Mey 1670 Her Ryal Highness The Grand Princess o Tuscany. 23 Mey 1670 - 5 Februar 1691 Her Ryal Highness The Most Serene Grand Duchess o Tuscany. 5 Februar 1691 - 17 September 1721 Her Ryal Highness The Most Serene Grand Duchess o Tuscany. This page wis last eeditit on 25 Dizember 2018, at 20:01.